The pursuit of appropriate, biocompatible materials is one of the primary challenges in translational bioprinting. The requirement to refine a biomaterial into a bioink places additional demands on the criteria for candidate biomaterials. The material must enable extrusion as a liquid bioink and yet be capable of maintaining its shape in the post-printing phase to yield viable tissues, organs and biological materials. Plant-derived biomaterials show great promise in harnessing both the natural strength of plant microarchitecture combined with their natural biological roles as supporters of cell growth. The aim of this review article is to outline the most widely used biomaterials derived from land plants and marine algae: nanocellulose, pectin, starch, alginate, agarose, fucoidan, and carrageenan, with an in-depth focus on nanocellulose and alginate. The properties that render these materials as promising bioinks for three dimensional bioprinting is herein discussed alongside their potential in 3D bioprinting for tissue engineering, drug delivery, wound healing, and implantable medical devices. 3D bioprinting is a rapidly evolving field of biomedicine, merging the disciplines of tissue engineering, materials science and 3D printing technologies to yield viable biological structures in customized spatial arrangements. The implications of the technology are immense, lending itself to fuel advancements in fields such as drug delivery, reconstructive and transplantation surgery, and implantable medical devices (Jovic et al., 2018). A primary challenge facing the translational potential of bioprinting for medical use is the pursuit of appropriate, biocompatible materials (Malkoc, 2018). Historically, a variety of materials have contributed toward the advancement of biomedicine, with the most noteworthy candidates including alloys, ceramics, metals, and composites (Le May et al., 1975). Although the desired properties for biomedical application may vary between materials, the fundamental requirements for in-vivo implementation remain universal. Successful tissue engineering demands that an optimal scaffold should interface with biological systems to support cell growth whilst displaying biocompatibility, non-toxicity, and providing the mechanical support to emulate natural tissue macro and microarchitecture (Drury and Mooney, 2003; Gungor-Ozkerim et al., 2018). The requirement to refine a biomaterial into a bioink places additional demands on the criteria for candidate biomaterials. The material must enable extrusion as a liquid bioink and yet be capable of maintaining its shape in the post-printing phase to yield viable tissues, organs, and biological materials. The search for a biomaterial with the appropriate balance of biological and mechanical factors is often fraught with conflict (Chimene et al.). Synthetic materials, such as plastics, traditionally convey superiority in addressing the mechanical properties required to support tissue growth and can be easily modified to augment their printability, viscosity, and strength. The major caveat of such materials lies in their restricted bioactivity: limited cell adhesion and lack of extracellular matrix mimicry translate to a limited capacity to support the biological components of cell growth (O'Brien, 2011). Furthermore, synthetic materials are often non-degradable which presents the risks of extrusion, immunogenicity, and impedance of de novo tissue formation (Sarkar et al., 2017). Of those that are degradable, toxic by-products may be released during the degradation process, presenting a risk of harm when implanted into humans. With the advent and evolution of nanotechnology, there has been a progressive focus on the use of natural materials for a variety of biomedical applications. Additionally, this rapidly growing industry has further highlighted the need for environmentally friendly biomaterials derived from sources free of ecological burden. Plant-derived biomaterials show great promise in harnessing both the natural strength of plant microarchitecture combined with their natural biological roles as supporters of cell growth (Gershlak et al., 2017). Enhanced bioactivity, biocompatibility, biodegradability, and mechanical stability are perceived advantages of plant derived materials (Yegappan et al., 2018), moreover as potential bioinks owing to their affinity for chemical modulation and facile hydrogel formation. As such, this new generation of abundant, natural, and renewable bioinks have attracted significant attention in the realm of 3D bioprinting research. The aim of this review article is to outline the most widely used biomaterials derived from land plants and marine algae (Figure 1), with an emphasis on nanocellulose and alginate, as two of the most researched materials in these respective categories. The properties that render these materials as promising bioinks for three dimensional bioprinting will thereafter be discussed. Figure 1. 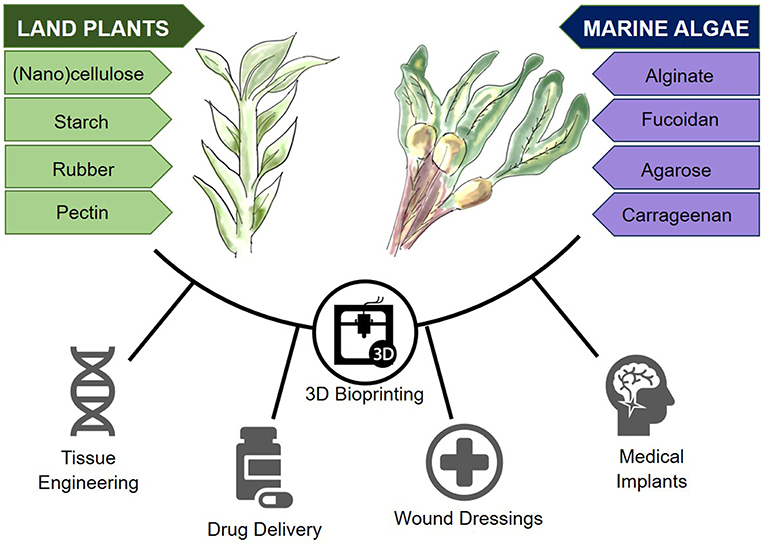 Plant-derived biomaterials from land and marine sources and their potential in 3D bioprinting. Biological printing “Bioprinting” enables the precise deposition of cells in a viscous biomaterial in a specific spatial arrangement using a computer-aided printer. The evolution of this technology from mainstream 3D printing has demanded increasingly complex printing methods to enable the biological roles of the ink, such as cell adhesion, and proliferation to be served in addition to the mechanical properties required of conventional 3D printing ink. Due to their embedded cellular material, bioinks are printed at much lower temperatures and demand mild, non-cytotoxic crosslinking methods to preserve cellular viability, and function (Malda et al., 2013). 3D bioprinting uses three major types of printing technology: inkjet, laser-assisted and extrusion (Table 1). Inkjet bioprinting uses low viscosity solutions, such as cell suspensions that are deposited at high shear rates as droplets of ~50 μm (micrometer) diameter (Hölzl et al., 2016). In contrast, laser assisted bioprinting focuses a laser toward a laser-absorbing biomaterial layer which in turn produces a local pressure to enable ink deposition (Derakhshanfar et al., 2018). Extrusion based bioprinting, or bioplotting, is the most common subtype, comprising the deposition of cells, and bioink using a nozzle driven by pneumatic, piston or screw forces (Landers et al., 2002; Jakab et al., 2008). Although slower than laser and inkjet printing approaches, extrusion bioprinting enables structural deposition, and solidification as each layer is deposited and is associated with good cell viability (Smith et al., 2004; Derakhshanfar et al., 2018). Each type of printing technology requires bioinks of differing viscosities for successful deposition: droplet and inkjet printers require viscosities of 1–300 mPa·s whereas extrusion-based printers require a minimum of 30–6 × 107 mPa·s (Aljohani et al., 2018). As such, bioinks with tunable viscosity are most likely to offer the versatility required to undergo printing using different technologies. Table 1. Summary of common 3D bioprinting technologies. Bioprinting technology is becoming an increasingly available and affordable technology to support tissue engineering research, with many research groups now opting to customize their own in-house devices owing to the widespread availability of open source software and firmware (Reid et al., 2016). A major limitation of bioprinting for biological constructs is the choice of a suitable bioink: one not only biologically conducive of cell growth but in possession of the necessary rheological properties such as viscosity, shear thinning, and crosslinking to optimize post-printing fidelity (Jessop et al., 2017; Kyle et al., 2017). In addition to biological and rheological properties, in order to be valid in vivo tissue replacements, bioinks must have adequate mechanical strength to support de novo tissue formation. Common mechanical assessments for bioinks include compressive, storage and elastic moduli, residual, and maximum compressive stresses (Chung et al., 2013). These parameters are of importance when considering the native properties of the target tissue type. Supportive structural tissues such as bone and cartilage, will have significantly greater biomechanical demands to withstand the myriad of load bearing and shear forces exerted in vivo. Articular cartilage for example, has a compressive modulus of ~2 MPa (Beck et al., 2016), whereas human bone has been shown to possess a tensile strength of 34–45 MPa, a compressive strength of 120–160 MPa, and a Young's modulus of 230–540 MPa (Havaldar et al., 2014). The pursuit of a material capable of emulating these structural properties, alongside possessing the rheological demands of a bioink adds to the challenge of material selection. As such, the search for novel materials has naturally progressed to the biologically and mechanically diverse array of plant-derived substances as candidate bioinks. Alginate is one of the most commonly used materials in 3D bioprinting. Alginate is renewably sourced from brown algae, commonly Laminaria hyperborean, Laminaria digitate, Laminaria japonica, Ascophyllum nodosum, and Macrocystis pyrifera (Lee and Mooney, 2012). Structurally, it consists of co-polymers composed of the polysaccharides β-D-Mannuronic acid (M) and α-L-Gluloronic acid (G) (Axpe and Oyen, 2016). Alginates contain blocks of G residues, blocks of M residues, and alternating M and G residues (Stößlein et al., 2019). The M and MG residues of the co-polymer have been shown to increase flexibility, whereas the G residues increase rigidity and the capacity for gelation (Axpe and Oyen, 2016). The natural ratio of M:G varies depending on the seaweed species from which the alginate is extracted (Cardoso et al., 2016) and also exhibits environmental and seasonal variability (Maleki et al., 2016). The various combinations therefore result in anionic compounds with a wide variety of biomedical applications. Commercially available alginate is acquired via acidification to extract the alginate as alginic acid. Thereafter the material is alkalinized and precipitated with sodium or calcium carbonate to generate an alginate salt. Vacuum filtration can then be used on the precipitated alginate to collect it (Fawzy et al., 2017; Patil et al., 2018). An alternative means of alginate production is through bacterial biosynthesis (Hay et al., 2013). This process is mediated largely by the species of the genera Pseudomonas and Azotobacter (Hay et al., 2013; Moradali et al., 2017; Urtuvia et al., 2017) and is a costly biofabrication process with a theoretical risk of pathogenicity. Alginate bioinks can be crosslinked readily after extrusion through simple immersion in calcium chloride solution (Wee and Gombotz, 1998). The crosslinking process itself enables structural fixation in a matter of minutes. Despite the speed of crosslinking, the mechanical properties of the crosslinked derivative render it susceptible to diffusion after extrusion, which results in structural deformation. Alternative approaches to rectify this issue include the use of barium chloride (Bajpai and Sharma, 2004) and a calcium chloride nebulizer, which demonstrates a more gradual crosslinking process with less potential for subsequent diffusion (Raddatz et al., 2018). The rheological properties of alginate-based bioinks must be considered in the context of 3D bioprinting (Ching et al., 2017). The viscosity of an alginate bioink is a product of alginate concentration and molecular weight; as well as the cellular density and phenotype of the laden cells (Axpe and Oyen, 2016). When using a cell laden hydrogel, the density of the biomaterial ideally should be the same as the cells, thus optimizing a homogenous cell suspension; increasing the concentration of alginate, and decreasing the degree of oxidization can increase density to the required level (Jia et al., 2014). Factors affecting viscosity include temperature, where viscosity is inversely proportional to an increase in temperature, and the concept of shear-thinning, where viscosity decreases as shear rate increases (Axpe and Oyen, 2016). In terms of degradation, the ideal solution is that hydrogels should degrade at a rate that mirrors the rate at which the cells produce their own extracellular matrix (Jia et al., 2014). When considering a biomaterial for 3D bioprinting, it is important to take into account viscoelastic properties. Alginate hydrogels have a propensity to increase the loss modulus and thereafter decrease the storage modulus of a bioink; whilst maintaining a consistent loss tangent through varying concentrations (Gao et al., 2018). However, when using a crosslinked alginate hydrogel, a higher storage modulus compared to loss modulus can be observed (Aguado et al., 2012). When utilizing an extrusion-based method of bioprinting, the extrusion pressure requirement increases as the viscosity increases, with the loss modulus having more of an impact that the storage modulus (Zhang et al., 2017). Unfortunately, there is a negative correlation between extrusion pressure and cell viability, and also loss tangent and structural integrity which must be taken into account when designing bespoke printing parameters using alginate hydrogels (Gao et al., 2018). Printing parameters of alginate are set to optimize the rheological, mechanical, and physical properties of alginate. As discussed, the viscosity of alginate is an important component to control when 3D bioprinting, it has been shown that a viscosity of 300–30,000 millipascal second (mPa·S) is optimal for printing, an alginate concentration of 2–4% provides this viscosity (He et al., 2016). Alginate can be printed effectively at a range of temperatures in order to achieve the required viscosity (He et al., 2016; Zhu et al., 2018). However, alginate-based hydrogels have been shown to be most effective at 37°C due to: accurate extrusion flow rate, decreased occurrence of obstruction and compatibility with cell viability (Ding et al., 2018). One study showed that for a 7% alginate/8% gelatin hydrogel, optimum printing parameters at 37°C are as follows: nozzle gauge = 30 G, printing pressure = 100 kPa, and printing speed = 4 mm/s (Webb and Doyle, 2017). Storage of alginate can be vast depending upon purpose; for example, cells encapsulated with alginate can be stored comfortably between 0 and 30°C and are fit for purpose, whereas it has been shown that in an alginate/gelatin hydrogel, storage at 3°C prolonged degradation when compared to storage at 37°C (Giuseppe et al., 2018). As discussed previously, the physicochemical properties of alginate can depend upon the G:M; where higher concentrations of G are more stable when compared to high M content (Axpe and Oyen, 2016). The molecular weight of the crosslinking agent and exposure time can be altered in order to regulate the elasticity (Young's) modulus of a hydrogel; for instance, using increasing concentrations of poly(ethyleneglycol)diamine as a crosslinker has been shown to increase the viscosity and toughness of the hydrogel (Naghieh et al., 2018; Meng et al., 2019). Another study showed an increase in elasticity modulus with increasing concentrations of Ca2+ which enabled an alginate-based hydrogel to improve mechanical properties whilst maintaining high ionic strength (Matyash et al., 2014). Tensile strength, Young's modulus and elongation at the break are components of the mechanical properties of alginate. It has been shown that uncrosslinked alginate has a tensile strength of 25.8 ± 7.3 megapascal (MPa), a Young's modulus of 12.9 ± 2.6 MPa, and an elongation at the break of 2.50 ± 0.8%. This study showed an increase in tensile strength, Young's modulus and elongation at the break when alginate hydrogels were crosslinked (with d-mannitol and xylitol) (Park et al., 2018). Nanocellulose, a versatile and abundant natural biopolymer, has shown great promise due to its robust mechanical properties, unique surface chemistry, desirable biological characteristics (high biocompatibility, low biodegradability, and non-toxicity), and cost efficiency. Generally, its architecture follows a hierarchical order progressing from an intricate arrangement of polymeric cellulose chains [~1 nanometer (nm)] and culminating in macroscopic fibrillar structures of ~5–20 μm (μm) in diameter. A structural hierarchy also exists within the microfibrillar motif itself, consisting of highly organized crystalline regions with alternating amorphous domains (Gumrah Dumanli, 2017). This configuration ultimately dictates the mechanical behavior of cellulose, with the disordered (amorphous) regions conferring flexibility and plasticity, and the ordered (crystalline) fraction contributing to the strength and elasticity of the bulk material (Lin and Dufresne, 2014). Broadly, nanocellulose can be categorized into three types: (1) Cellulose nanocrystals (CNC), (2) Nanofibrillated cellulose (NFC), and (3) Bacterial cellulose (BC). The plant-derived constituents (CNC & NFC) have recently generated considerable research activity and are largely favored for their sustainability; more-so considering the virtually inexhaustible feedstock from which they are isolated. Popular sources for CNC and NFC extraction include wood, hemp, cotton, potato tuber, and algae (Lin and Dufresne, 2014). The production of nanocellulose largely involves the chemical and/or mechanical breakdown of lignocellulosic biomass in a “top-down” fashion. Cellulose nanocrystals are most commonly derived through acid hydrolysis; a method which removes the amorphous regions whilst preserving crystalline morphology (crystallinity ~54–88%) (Phanthong et al., 2018) This process also contributes to the hydrophilicity of CNCs and results in a compound with deformation qualities theoretically similar to those of Steel and Kevlar [Young's modulus ~167.5 (gigapascals) GPa] (Tashiro and Kobayashi, 1991). The molecular dimensions can range from 3 to 50 nm in diameter and 50 nm−3 μm in length, dependent on the percentage crystallinity of the primary source (Dumanli et al., 2014). In contrast, high-pressure homogenization (before or after enzymatic treatment) is often the method of choice for the extraction of nanofibrillated cellulose. In NFC, both the amorphous and crystalline sequences of the elementary cellulose structure are conserved, resulting in a product of longer length, high surface area, and extensive hydroxyl groups for surface modification (Lavoine et al., 2012). Although cellulose is widely regarded as a low-cost biomaterial, the intensive processing and modification steps involved in nanocellulose production further contribute to the overall price. With this considered, cost efficient processes for the bulk production of nanocellulose present an area warranting further scientific attention (Klemm et al., 2011). Conversely, the biosynthesis of bacterial cellulose is somewhat distinct to that of plant-based biomaterials in that low molecular weight sugars are naturally assembled in a “bottom-up” process. Furthermore, this mechanism excludes various constituents otherwise found in lignocellulose (i.e., lignin, pectin, and hemicellulose). For this reason, bacterial cellulose has garnered attention as a highly pure and biocompatible resource. Regardless, due to their pre-existing infrastructure for harvesting, pulping, and cost efficient processing, plants undoubtedly offer an optimal source for sustainable nanocellulose derivation (Hao et al., 2015). From a morphological viewpoint, nanocellulose boasts an array of desirable properties for 3D bioprinting, and tissue engineering. NFC based hydrogels consistently display non-Newtonian, shear thinning (viscoelastic) behavior, generally portrayed by their large storage modulus over the loss modulus at minimal shear rates (Markstedt et al., 2015). More elaborately, the storage (G') and loss (G”) moduli of nanocellulose may be considered accurate indicators of elastic and viscous response, respectively. In a recent study, the storage modulus for NFC, CNC, and Nanocellulose “blends” (NFC and CNC in mixture) was shown to be greater than the loss modulus across all frequencies studied, thus inferring a dominance in elasticity for these biomaterials and demonstrating the presence of robust interconnectivity between nanostructures (Kyle et al., 2018). Furthermore, the examined systems also demonstrated a loss tangent (tan δ) of <1 indicating an inherent propensity for a lower dissipation potential (i.e., greater elastic response) amongst the biomaterials studied. The flow properties for these samples were also investigated by measuring the loss modulus as a function of shear rate. The retention of viscosity at zero shear and preservation of shape fidelity was especially marked within the nanocellulose blends; possibly due to widespread entanglement between the micro- and nanostructures within the composite hydrogel (Kyle et al., 2018). As detailed by (Chirayil et al., 2014) the concept of shear thinning may be attributed to the orientation of nanocellulose microstructures in the direction of shear flow. At low shear rates, the NC nanoarchitecture exhibits a coiled configuration which progressively disentangles at increasing rates to align its axis with the direction of flow. An amalgamation of these characteristics thus allows for the seamless extrusion of bioink as a liquid phase precursor, with preservation of post-printing shape fidelity within the hydrogel construct. Moreover, the introduction of aldehyde and carboxyl functional groups promotes the formation of readily cross-linkable substrates, thereby overcoming current challenges in the stabilization of pure nanocellulose hydrogels (Markstedt et al., 2015). CaCl2 mediated crosslinking has, however, been shown to disrupt the “macro-pore” appearance of the printed construct. Additionally, the introduction of dialdehyde functional groups through periodate oxidation may also induce pro-inflammatory TNFα gene expression (Kollar et al., 2011). Despite this, further exploration of such novel approaches may yet yield innovative solutions for the relatively poor cross-linking ability of pure nanocellulose. Alternative strategies for hydrogel cross-linking have therefore been revised, with the most noteworthy involving the incorporation of divalent/trivalent cations (i.e., Ca2+, Cu2+, Al3+) (Dong et al., 2012) and covalent cross-linkers (Syverud et al., 2011). Thermogravimetric analysis of NFC, CNC and bled has, additionally, been used to characterize stability through the measurement of rate and onset of thermal degradation (Kyle et al., 2018). For tissue engineering purposes, all three nanocellulose formulations may be utilized at physiological temperature (37°C) and remain stable above the recommended temperature for autoclaving (121°C). A small degree of moisture loss has, however, noted between 50 and 140°C and subsequently warrants investigation into the effects of heat sterilization on NC nano- and microarchitecture. Agarose is derived from red seaweed and has garnered interest in the plant derived 3D bioprinting sphere due to its ability to be prepared as a thermal-reversible gel (Zarrintaj et al., 2018). It exhibits many of the properties of alginate, emulating the extracellular matrix with high water uptake, but with the advantage of hydrogen bond-mediated self-gelation without the need for potentially toxic crosslinking agents such as genipin (Campos et al., 2018). It has however been noted to be adversely mechanically affected by the presence of cells: cells within agarose diminish the gel strength due to interference with the hydrogen bonding required for crosslinking and gelation (Shoichet et al., 1996). This limitation can be somewhat surmounted through combination with other polymers and proteins such as collagen, chitosan, and cellulose to increase cell affinity (Annamalai et al., 2016; Awadhiya et al., 2017). Research into the role of agarose composites has been explored for tissue engineering purposes for neural, vascular, bone, and pancreatic tissue (Bhatnagar et al., 2016; Zarrintaj et al., 2018). However, further refinement will be required to produce bioinks possessing the necessary properties for bioprinting purposes. Young's modulus of agarose is heavily dependent upon gel concentration; one study showed a variance between ~5.6 kPa (0.4% agarose) and ~17.4 kPa (1.2% agarose), whereas another showed values ranging from 130 kPa (1% agarose) to 3,000 kPa (10% agarose) (Ahearne et al., 2005; Walker et al., 2011). Both the storage modulus and loss modulus of agarose are positively correlated with concentration of agarose; and agarose is noted to be significantly elastic (Chen et al., 2003). Compared to hydrogels such as gelatin, collagen, and alginate, agarose displays high viscosity. Even at the highest shear rates, one study noted viscosity of a 4% solution to be 257 mPas·s, which may restrict its use for inkjet printers with high kinetic energies. Furthermore, in order to maintain agarose hydrogels in liquid state, their temperature must be maintained above 37°C: a biologically viable temperature, but one that carries additional considerations for storage and printing (Benning et al., 2018). It has been shown that storage and loss modulus increase with frequency, as well as the loss tangent (Walker et al., 2011). Agarose has been shown to have high mechanical strength with tensile strengths of 31.03 ± 0.74 MPa reported, along with an elongation at break value of 45.2 ± 2.7% (Rhim, 2012). Carrageenan is a relatively under researched polygalacton derived from the Rhodophyceae members of red algae seaweeds. The material is composed of alternating long chains of α-1, 3 D-galactose, and β-1, 4 3, 6-anhydro-galactose with ester sulfates which emulate the structure of mammalian glycosaminoglycans (Yegappan et al., 2018). Carrageenan can undergo both thermal and ionic gelation, and combined with other materials such as poly(oxyalkylene amine) (Bakarich et al., 2014), methacrylic anhydride (Chimene et al., 2018) and nanosilicates (Wilson et al., 2017; Chimene et al., 2018) to produce a printable bioink capable of extrusion and shape retention, with high fidelity, elasticity and stiffness (Wilson et al., 2017) to enable cross-linkable multi-layered tissue constructs. Young's modulus of carrageenan, like agarose is dependent upon the concentration of carrageenan, with values ranging from 0.10 MPa (1% carrageenan) to 0.66 MPa (3% carrageenan) and becoming increasingly unpredictable as water content increases (In et al., 2014). The tensile strength of carrageenan has been reported as 39.34 ± 0.51 MPa, as well as elongation at break value of 19.5 ± 0.4% (Rhim, 2012). Carrageenan-based bioinks have demonstrated good cell viability and attachment (Chimene et al., 2018), plus an affinity for osteogenesis (Li J. et al., 2015), augmenting the compressive strength of collagen-hydroxyapatite based composite gels for bone tissue engineering (Feng et al., 2017). The presence of the sulfated backbone in carrageenan mimics naturally occurring sulfated glycosaminoglycans in cartilage extracellular matrix (Bhattacharyya et al., 2010; Popa et al., 2015) and has demonstrated chondrogenicity, non-toxicity and mechanical properties similar to that of native cartilage (Popa et al., 2015). The facile crosslinking and glycosaminoglycan mimicry make carrageenan an especially exciting prospect for cartilage bioinks for tissue engineering. Pectin is a natural constituent of plant cell walls, possessing high molecular weight, and hydrophilicity, making it an ideal candidate for hydrogel formation and subsequently 3D bioprinting. As with other model bioinks, pectin is a highly versatile hydrogel with rheological and viscoelastic properties amenable to modulation, independently of the cell adhesive ligand density (Pereira et al., 2018a). The elastic modulus (G') of pectin may be finely tuned through adjustments in polymer and/or crosslinker concentration, thus allowing for the biomechanical mimicry of a broad range of native human tissue types. Ionic crosslinking with CaCl2 also results in a substantial increase in yield stress (τy) and therefore significantly augments the extrudability of the hydrogel and shape fidelity of the printed construct (Cui et al., 2017). Industrially, pectin is derived from waste materials from juices, apples, and cider industries through acidic and thermal extraction (Jayani et al., 2005). Gelation is possible through densely concentrated pectin solutions, thereby increasing polymeric entanglements, but also through exposure to acidic conditions and divalent or trivalent cations (Munarin et al., 2012). Similarly to alginate, pectin is readily crosslinked in the presence of divalent calcium ions, which interact through the carboxyl groups to induce bridges between homogalacturonic chains (Fang et al., 2008). Pectin, compared to other natural polymers is largely unexplored in its tissue engineering and regenerative capacity (Munarin et al., 2012). A major limitation, as with alginate amongst other polysaccharides, is its limited capacity for cell adhesion. Nonetheless, the role of pectin as a scaffold for bone tissue engineering has been explored with promising potential (Coimbra et al., 2011; Munarin et al., 2011), with cell adhesion augmented through chemical modification (Kokkonen et al., 2006) and combination with other materials such as polyvinylalcohol (Yao et al., 2009). Starch is a highly abundant storage polysaccharide derived from cereals and tuber plants such as potatoes (Lu et al., 2009). Starch molecules are typically composed of ~30% amylose and 70% amylopectin, though natural variation from this ratio occurs depending on the source of extraction (Cherian Vengal and Srikumar, 2005). Starches with higher amylose content confer greater crystallinity and subsequent firmness (Ige et al., 2012). Its hygroscopic nature enables reversible hydration and therefore promotes seamless hydrogel ejection for extrusion-based printing methods. The viscoelastic properties of starch are principally reliant on several mechanical variables, namely concentration, extrusion temperature, storage modulus (G'), yield stress (τy), and flow stress (τf). As a proxy for construct stability, G' and τy refer to the hydrogels potential to withstand its own weight when printed in successive layers whilst concentration, temperature, and τf are markers of extrudability. Intuitively, a moderate to high G' and τy in combination with a low τf constitute the ideal parameters for a highly desirable starch hydrogel for heat extrusion 3D bioprinting (Chen et al., 2019). In their rheological characterization study, Chen et al. (2019) demonstrated that Rice Starch of concentration 15–25% (w/w) extruded at 80°C, Potato Starch [15–20% (w/w)] at 70°C and Corn Starch [20–25% (w/w)] at 75°C expressed ideal τy [32–455 Pascals (Pa)], τf (140–722 Pa), and G' (1150–6909 Pa) values for heat extrusion 3D Bioprinting, thereby conferring excellent printability, shape fidelity and resolution. In a separate study, the use of starch hydrogels with a predominantly elastic response (i.e., tan δ of ~0.1 and 0.2), yield stress between 60 and 730 Pa and dynamic modulus (G*) between 300 and 1,200 Pa at 1 Hertz (Hz) has been extensively advocated (Huang, 2018). It is, however, important to appreciate that although primarily related to the 3D bioprinting of edible products, these printing specifications remain to be translated into application for 3D tissue engineering. Furthermore, starch molecules may be compounded with other biopolymers to augment properties for bioprinting applications (Ige et al., 2012). Starch is considered highly biocompatible, and as such starch and its compounds have been considered as potential scaffolds for tissue engineering and drug delivery. Indeed cell encapsulation within starch-based hydrogels have been investigated to demonstrate high cell viability and adhesion with rheological properties analogous to a myriad of human tissue types (Dong et al., 2016). More specifically, the rheological versatility of starch allows for the flexible regulation of hydrogel composition to closely emulate the storage modulus of native tissue, thereby satisfying various mechanical requirements as an ideal 3D culture platform for different cell types. Additionally, the effect of hydrogel compositional variations on swelling kinetics and equilibrium swelling ratios has also been examined. In particular, the hydrophilic nature of sulfobetaine-derived starch encourages water retention within the hydrogel; a characteristic which potentiates nutrient, signal factor and metabolic waste transportation and ultimately promotes the differentiation of encapsulated cells (Dong et al., 2016). As such, research into the role of starch-based polymers for 3D bioprinting has been commenced, in particular for bone tissue engineering (Gomes et al., 2002; Salgado et al., 2004; Martins et al., 2009). However, further research needs to be undertaken to ascertain its validity as a viable bioink for multi-tissue bioprinting purposes. Fucoidan is an anionic sulfated, water-soluble polysaccharide derived from marine brown algae. The material has garnered interest owing to its potential antioxidant, anti-inflammatory (Fitton, 2011), and angiogenic (Purnama et al., 2015; Marinval et al., 2016) properties for tissue engineering purposes. The rheological properties of fucoidan also appear conducive of bioprinting with shear thinning behavior observed below 1.5% weight-volume yet plastic behavior at 2% with a yield value of 2Pa. Dynamic viscoelasticity was also observed: increased by increasing the concentration in solution and through the addition of NaCl and CaCl2, and decreased at higher temperatures (Tako, 2003). Both linear and branched subtypes of fucoidan have been characterized with distinct rheological properties. Indeed the variability in viscosity appears to vary with the species of seaweed from which the fucoidan is derived, reflecting differences in molecular weight, proportion of sulfates, and uronic acids. As with many of the polysaccharides, combination of this material with chitosan, gelatin, alginate, and hydroxyapaitite has been performed to produce constructs for wound dressings and bone tissue engineering scaffolds (Venkatesan et al., 2014; Lowe et al., 2016). Fucoidan has also been combined with chemotherapeutic agents displaying promise as a drug delivery material in vitro and is believed to possess indirect antimicrobial activity (Lee et al., 2013) which confer excellent biological potential for the development of future bioinks. The abundancy, gelation capacity, and bioactivity of plant derived biomaterials hold exciting potential as bioinks for 3D bioprinting. In particular, extensive research has been undertaken on the potential role of alginate and nanocellulose as tissue engineering scaffolds, wound healing adjuncts, drug delivery systems, and implantable medical devices. As such, current research on these two biomaterials at the forefront of bioprinting technology will be explored throughout the subsequent section of this review. Biocompatibility describes a harmonious and non-deleterious relationship between implanted foreign material and host tissue. Hydrogels are designed to mimic the composition of natural extracellular matrix with high cellular biocompatibility (Aljohani et al., 2018), whilst demonstrating the viscoelastic properties to promote fluid dispersion through extrusion-based bioprinting methods. These features are readily exploited in the field of biomedicine; where alginate, nanocellulose, and other plant derived biomaterials are typically employed as model hydrogels (Cardoso et al., 2016) for tissue engineering, pharmaceutical drug delivery, and wound healing (Santana et al., 2013; Patil et al., 2018). With respect to cellulose and its derivatives, biocompatibility is thought to be heavily reliant on surface chemistry, most notably: topography, wettability, charge and presence of hydrophobic, and hydrophilic domains (Pertile et al., 2010). Intuitively, modification of these parameters has been shown to augment cellular adhesion and bioactivity. In particular, modulation of CNC surface charge is known to increase cellular affinity for the biomaterial through an increase in cell adhesion proteins and subsequent cellular proliferation (Aggarwal et al., 2013). Moreover, nanocellulose also demonstrates good hemocompatability in vitro (Wang et al., 2013) and when implanted into mice models in vivo (Shimotoyodome et al., 2011). The functionalization of polyurethane with CNF has recently shed light on the potential use of nanocellulose as a novel candidate for vascular prosthesis due to its low thrombogenicity and exceptional biochemical versatility (Lin and Dufresne, 2014). Alginate is perceived to be highly biocompatible, non-thrombogenic polymer in its natural state, and thus has been utilized in a plethora of medical treatments (Liberski). However, alginate is amenable to structural modification to render it both thrombogenic and anti-thrombogenic. In its sulfonated form, alginate has been shown to have an anti-thrombogenic effect; alginate sulfate has been shown to be comparable to heparin (also a sulfated polysaccharide) when measuring the activated partial thrombin time (APTT), but shows no significant effect on the prothrombin time (PT), leading to the conclusion that it has an inhibitory effect on the intrinsic coagulation pathway (Ahearne et al., 2005). Whereas, calcium sodium alginate fibers are utilized widely in clinical practice as hemostatic wound dressings (Thomas, 2000). The modifiable properties of alginate undoubtedly augment its applications for clinical use and further examples of clinical trials using alginate include the treatment of pressure sores, post-operative intrauterine adhesions, reflux suppression, weight loss, skin grafts, burns, and surgical wounds (Nowacki et al., 2017). Overall, nanocellulose, like most plant derived biomaterials, is widely regarded as a biocompatible resource, with negligible immunogenic responses observed in vivo (Miyamoto et al., 1989). The lack of cross reactivity may somewhat be attributed to its inherent resistance to degradation within the human body, largely pertaining to the absence of cellulase enzymes in humans. It, however, still stands that the long-term effects of a non-degradable material may confer a risk of delayed immunogenicity (Lin and Dufresne, 2014). Closely allied to biocompatibility is the concept of toxicity, with both terms often used synonymously. The cytotoxicity of CNC against nine individual cell lines was determined and exhibited no cytotoxic phenomena in the concentration range and exposure time studied (0–50 μg/ml and 48 h) (Dong et al., 2012). Furthermore, no cytotoxic or inflammatory events were recorded in the assessment of NFC on mouse and human immune cell lines in vitro (Vartiainen et al., 2011). In contrast, various studies have conversely described an increase in cytotoxicity and gene expression modification, more-so at higher CNC concentrations (> ~100 μg/ml). In particular (Pereira et al., 2013), demonstrated a dose-dependent reduction in fibroblast cell viability, with a positive relationship between CNC concentration and the expression of stress related biomarkers (HSP70.1, PRDX1 & BAX). Such dose dependent toxicity has also been illustrated in vivo following inhalation of CNC (Lin and Dufresne, 2014). Notwithstanding the vast evidence in support of plant derived biomaterials as an inherently safe biomaterial, further research may be required to comprehensively characterize their toxicology for biomedical application. More specifically, the potential risks associated with modification and crosslinking should be thoroughly explored. Current challenges within the field of tissue engineering focus on the production of biocompatible scaffolds which accurately mimic the native in vivo environment. As previously highlighted, the topography and architecture of natural scaffolds (i.e., surface topology and porosity, fiber density, and network structure) fundamentally dictates the cell-biomaterial interactions and, therewith, cellular behavior (Jorfi and Foster, 2015). With specific reference to 3D bioprinting, a balance between these biological qualities and the requirements for good printability is often difficult to attain. According to a recent report by Global Market Insights, Inc (Nanocellulose Market Size–Industry Share Analysis Report 2017-20241) the nanocellulose market is projected to exceed USD 1 billion by 2024. In light of such great economic potential, the amount of research activity surrounding the use of lignocellulosic biomaterials continues to grow exponentially (Jorfi and Foster, 2015). For this reason, the applicability of nanocellulose at both microscopic (cell culture) and macroscopic (tissue engineering, repair, implants, drug delivery etc) levels is of significant value to the field of biomedicine. Alginate has appeal as a candidate biomaterial owing to its low-cost, highly biocompatible, biodegradable, and non-toxic nature plus its ability to be processed into a hydrogel (Ching et al., 2017). Of the plant derived biomaterials, alginate is used most extensively for 3D bioprinting applications. Biocompatible scaffolds using alginate hydrogels have been shown to have great efficacy for tissue engineering and cell culture (Dai et al., 2016), plus the high biodegradability and renewability of alginate is a major advantage over plastic-based compounds in 3D bioprinting (Ching et al., 2017). 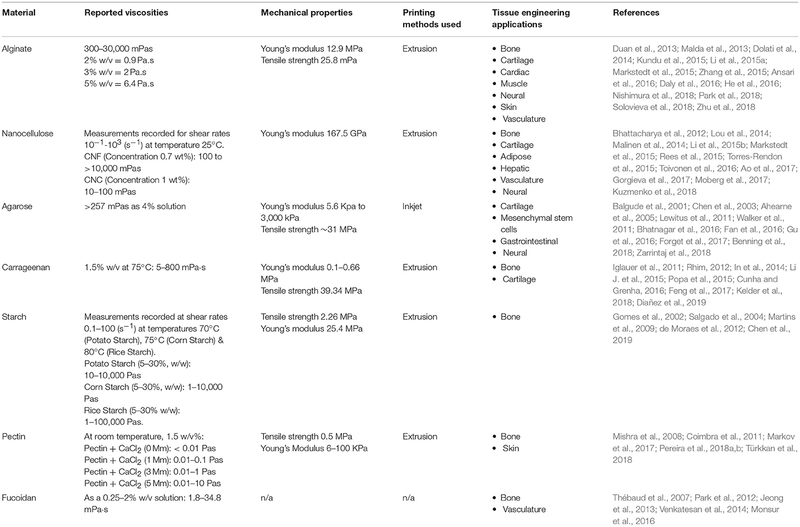 The versatility of plant derived biomaterials such as alginate and nanocellulose as isolated and composite scaffold have been demonstrated in the 3D bioprinting of blood vessels, bone, cartilage, and skeletal muscle (Table 2). However, the validity of plant derived biomaterials are not without limitation. Biofabrication of nanocellulose is hindered by poor cross-linking potential and shape fidelity post-printing, whereas alginate alone has only a moderate affinity for cell-adhesion or proliferation (Lee and Mooney, 2012). As such, nanocellulose and alginate hydrogels are often combined with materials that augment the desired characteristics for enhanced 3D bioprinting. Table 2. Properties and tissue engineering applications for plant-derived biomaterials (n/a = not available). Using extrusion-based bioprinting with an alginate scaffold, vascularized bone tissue has been synthesized with high tissue viability (Dhawan et al., 2018). Whole bone organ engineering has been studied using an alginate based bioink with Arg-Gly-Asp adhesion peptides reinforced with polycaprolactone fibers. This combination of materials made it possible to engineer an entire vertebral body. This in vivo supported vascularized endochondral bone with supporting marrow structure, potentially leading to future prospects of bioprinting vertebrae for patients with vertebral osteoporosis/fractures (Daly et al., 2016). Likewise, NFC composite scaffolds for 3D bio-printing of bone tissue have also been successfully constructed from a variety supporting biomaterials, most notably chitin (Torres-Rendon et al., 2015), gelatin (Gorgieva et al., 2017), and hydroxyapatite (Ao et al., 2017). Cartilage tissue has been successfully bioprinted using an alginate-nanocellulose bioink, in which the study concluded the combination alginate and nanocellulose was conducive to bioprinting live human cartilage (Markstedt et al., 2015). The study successfully combined the rheological properties of NFC (i.e., high printing resolution and shape fidelity) with the increased storage modulus of alginate for cartilage tissue engineering applications. The sheer thinning behavior of the composite hydrogel (NFC-A) enabled printing of anatomically shaped cartilage constructs (e.g., human ear and sheep meniscus), with high human chondrocyte viability (86%) after 7-day culture. It was later determined that the same NFC-A scaffold promotes human nasal chondrocyte redifferentiation, conservation of phenotype and production of cartilage specific ECM components, thus resembling in vivo chondrogenesis (Martínez Ávila et al., 2016), plus when using human nasal chondrocytes, cell proliferation was high and there was enhanced deposition of human collagen II (Möller et al., 2017). For the purposes of cartilage tissue engineering it has also been demonstrated that combining alginate with nanocellulose addresses the issue of cell adhesion, thereby increasing cartilage ECM deposition (Aljohani et al., 2018). Combining alginate with collagen has also surmounted the issue of cell adhesion, demonstrating increased cell viability, tensile strength, cellular proliferation, and an increased capacity for cell adhesion (Yang et al., 2018). Advances in soft tissue engineering have similarly resulted in NFC and alginate based conductive bio-inks for the generation of neural, dermal and vascular tissue scaffolds, among others. It was discovered that human-derived neuroblastoma cell adhesion, differentiation and proliferation was potentiated by a NFC-carbon nanotube composite with minimal effect on cell viability (Kuzmenko et al., 2018). Furthermore, as validated by Li et al. (2015b) bFGF impregnated CNC-collagen scaffolds were able to demonstrate angiogenic and skin generation capabilities at in vitro and in vivo alike, thus alluding to their infinite potential within the field of regenerative medicine. Fabrication of tissue engineered aortic valve conduits using an alginate/gelatin polymer bioink has been successfully achieved using 3D bioprinting techniques. It was found that by direct encapsulation of smooth-muscle cells and aortic valve leaflet interstitial cells, the tensile strength of the biopolymer held after a 7 day culture (Duan et al., 2013). Alginate based scaffolds have also been tested in vitro as a potential candidate for muscle tissue engineering (Ansari et al., 2016). A significant challenge in tissue engineering is vascularization. Adequate blood supply to new tissues is a prerequisite for the survival in vivo, and until addressed will limit the scale of viable tissue that can be produced. Using advancements in three dimensional printing technology, it is now possible to synthesize intricate hollow, branched blood vessels and artificial blood vessels have now been created and optimized using 3D printing technology. An initial technique involved using an alginate bioink laced with carbon nanotubes to 3D bioprint mechanically stable vascular conduits. This study concluded that further research should focus on replacing the nanotubes with natural protein nanofibers to allow for large scale tissue production (Dolati et al., 2014). Alginate has been used to encapsulate human umbilical vein smooth muscle cells and thereafter bioprint vasculature conduits in vitro. These conduits showed good proliferative activity and deposition of both smooth muscle matrix and collagen on the peripheral and luminal surface when examined histologically (Zhang et al., 2015). This technique has been further extrapolated to bioprint a perfusable human coronary artery tree using alginate as the primary scaffold material (Hinton et al., 2015). Interestingly, injectable alginate has been shown to promote neovascularization, restore partial blood flow, and tissue function of the heart muscle in-vivo, when injected directly into the ischemic site of patients with myocardial infarction or peripheral arterial disease (Ungerleider and Christman, 2014), alluding to a potential angiogenic role of this natural biomaterial. Bioprinting of alginate microfibers have additionally been combined with theta-glass capillaries to facilitate the formation of vascular architecture with exciting implications for the future of vascularized tissue engineering (Nishimura et al., 2018). The applicability of NFC as a stand-alone resource has also been fruitfully explored within the realms of cell culture and organoid development, with implications for organ replacement, and drug testing modalities. In a study on 3D organoid development, wood-derived NFC hydrogels were used to successfully expedite the differentiation of HepaRG liver progenitor cell lines in vitro (Bhattacharya et al., 2012). Their results demonstrated the formation of 3D multicellular spheroids with the morphological hallmarks of hepatic tissue, namely functional bile canaliculi and apicobasal polarity. Similarly, the use of NFC hydrogels as a viable medium for human pluripotent stem cell culture ultimately promises a flexible and xeno-free resource for application within drug research and regenerative medicine industries (Lou et al., 2014). Despite their promise as bioinks for tissue engineering, further characterization of the toxicological properties, immunogenicity, and in vivo durability of these materials needs to be elucidated to determine their validity over widely used synthetic materials such as polylactic acid and polycaprolactone (Pariente et al., 2001). Many of the plant-based materials are being translated from the food industry, where their bioactivity, rheological properties, and facile gelation have garnered significant interest in bioprinting (Seidel et al., 2017; Vancauwenberghe et al., 2017). However, many of the crosslinking methods, especially those involving high temperatures, harsh chemical conditions and ultraviolet radiation, warrant further adaptation to ensure biocompatibility, and cell viability is preserved if these methods are to be used for tissue bioprinting purposes. The degree of heterogeneity in biomaterial blends observed in this review reflects the need to optimize mechanical properties to match the demands of the target tissue type. As such, further refinement and characterization of plant-based composite bioinks is both anticipated and warranted prior to considering their application for clinical use. Hydrogels hold exciting potential for wound healing applications in maintaining a moist environment conducive of accelerated healing with high biocompatibility to facilitate cell migration, proliferation, and reepithelialisation (Liu et al., 2016; Kamoun et al., 2017). Furthermore, their ability to encapsulate cells, growth factors, and antibacterials holds tremendous promise for the bioprinting of customizable wound dressings (Boateng et al., 2013). Nanocellulose continues to command significant scientific interest for its role in the homeostatic regulation of wound healing. NFC-based hydrogels and films have been shown to exhibit lower wound adherence, high moisture content, and the ideal swelling properties to closely emulate in vivo tissue repair (Madaghiele et al., 2014). The versatility of nanocellulose is further reflected in its affinity for structural modification and functionalization. The porosity and surface topography of NFC hydrogels may be modified to augment the adsorptive and bacterial anti-adhesion capabilities of the wound dressing (Jack et al., 2017). Two studies (Rees et al., 2015) (Chinga-Carrasco and Syverud, 2014) highlighted the potential benefits of carboxymethylated-periodate oxidized nanocellulose (C-Periodate NC) for 3D bioprinting and wound dressing applications. Following comparative analysis, C-Periodate NC was found to exhibit rheological favourability (i.e., marked shear thinning, low viscosity) over the TEMPO oxidized alternative (Rees et al., 2015). C-Periodate's unique poly-anionic surface chemistry was also shown to encourage the formation of 3D micro-porous structures with pH responsitivity. Such technology may be utilized in chronic wound management for the controlled release of antimicrobial agents into biofilms (Chinga-Carrasco and Syverud, 2014). Alginate has been produced as sponges, foams, fibers, and hydrogels for wound healing purposes (Sun and Tan, 2013). Its gel-forming ability enables a moist environment surrounding the wound, promoting healing, and leading to a superior cosmetic repair (Zhu et al., 2018). High water absorptivity and optimal water vapor transmission rate make alginate excellent at treating wounds with large volume exudate; in addition, cell-adhesion is limited thereby reducing the occurrence of secondary injury when removing the dressing, making alginate excellent for use in burns patients (Mirzaei et al., 2018). Other useful effects of alginate include a haemostatic effect and stimulation of monocytes to produce IL-6 and TNF-α, thus promoting pro-inflammatory factors which aid in wound healing (Sun and Tan, 2013). Colonization by potentially pathogenic microbes is a perceived disadvantage of conventional alginate dressings. Anti-microbial variants has been created based upon a combination of alginate and chitosan nanoparticles (Karri et al., 2016), high concentration M based alginate aerogels with an amidated pectin and doxycycline core (De Cicco et al., 2016), and combining alginate and calcium fluorine in a nanocomposite hydrogel, which inhibit bacterial growth and promotion cell proliferation for wound healing (Shin et al., 2019). 3D bioprinting personalized wound dressings holds the potential for the dressings to be printed as biomimics of the defect site, this may be achievable by seeding with skin, fat or muscle cells and/growth factors in order to augment the healing process (Aduba and Yang, 2017) and would also enable the controlled microspatial placement of antimicrobial agents. The potential role of plant derived biomaterials for wound dressings composed of carrageenan (Yegappan et al., 2018), starch (Pal et al., 2006; Kamoun et al., 2017), and pectin (Giusto et al., 2017) have been explored, with evidence of cell migration into chronic wounds, and the incorporation of antimicrobial agents having also been documented (Yegappan et al., 2018). The safety and efficacy of drug delivery can be enhanced and temporally controlled through the attachment to a biomaterial carrier. Within the 3D bioprinting strategies for versatile drug delivery, plant-derived scaffolds have demonstrated promise in numerous clinical settings. In the pharmaceutical industry, biomaterials such as alginate, and cellulose are used as an excipient to stabilize and protect the active drug compound, especially in non-water-soluble drugs (Crowley et al., 2004; Cardoso et al., 2016). Alginate may also be used as a carrier to immobilize and encapsulate drugs, bioactive molecules, proteins, and cells due to its high biocompatibility and biodegradability (Senna et al., 2018). Hydrogels, porous scaffolds and microspheres have also been investigated for controlled drug use. Alginate has been used to enable modified/extended release of an active drug within the body (Tønnesen and Karlsen, 2002) and as a component in the construction of capsules used for cell-encapsulation. For cytotherapy, combined with chitosan, the mixture demonstrates high cell viability (Correia et al., 2013) and may be also combined with calcium carbonate to selectively trap of molecules on hydrophilic domains, or polyethylene glycol to protect the microcapsules from acidic environments such as gastric acid (Borvinskaya et al., 2018; Ren et al., 2018). These properties have enabled composites of alginate to be trialed in the treatment of degenerative diseases such as osteoarthritis (Wang et al., 2011). The controlled delivery of TGF-β, using macro-porous alginate scaffolds, have been shown to repair articular cartilage defects in rabbits (Mierisch et al., 2002) and alginate blended with polyethylene glycol has been used as a vector in delivering VEGF to hMSCs to encourage osteogenic differentiation (Miao et al., 2014). Specific placement of drug molecules in hydrogels such as alginate is attainable using 3D bioprinting techniques (El-Sherbiny and Yacoub, 2013). Layer-by-layer assembly of gelatin and alginate has been used to load insulin-like growth factor-1 (IGF-1) onto neural stem cells (NSCs); the alginate enabled modified release of IGF-1 onto NSCs. The result significantly improved the proliferation and differentiation of NSCs leading to a potential treatment for nervous system disorders such as stroke (Li et al., 2015a). The combined drug delivery and bioink potential of plant derived materials heralds an exciting future for the development of targeted chemotherapies and wound management strategies. NFC-PNIPAM hybrid microspheres were extensively studied by and exhibited high drug-loading capacity and unique dispersion properties for 5-fluorouracil. In comparison, polyethyleneimine-alginate nanoparticles have been shown to be an effective vector for the transfection of functional DNA and siRNA into target cells, with potential applications within gene silencing of viral loaded and malignant cells (Weinberg and Morris, 2016; Wang et al., 2017). Nanocellulose materials can also be modified with chitosan oligosaccharide for the prolonged systemic release of cationic drugs such as Imipramine and Procaine (Akhlaghi et al., 2014) whereas the poly-anionic surface chemistry of oxidized nanocellulose demonstrates a micro-porous architecture with extensive drug loading capacity and delivery (Chinga-Carrasco and Syverud, 2014) displaying pH responsivity. As such, dressings with the potential for controlled and intelligent antimicrobial and analgesia release could be bioprinted using this technology. It therefore stands that sustained future research promises a wealth of insight into the design of drug delivery systems for novel and biologically active pharmaceutical technologies. The degradability of biological materials such as starch and alginate in vivo increases their appeal as a scaffold material for tissue engineering, enabling their replacement with the expanding mass of de novo tissue. These properties do however render them unsuitable for use as a permanent medical device or implant. Nanocellulose however, generally portrays low biodegradability in vivo owing to an absence of cellulase enzymes in vertebrates. With the relatively corrosive internal bodily environment considered, the innate resistance of cellulose to external chemical perturbations makes it an invaluable resource in the development of implant applications. Due to their pseudoplastic nature, nanocellulose bioinks may be intricately extruded to form complex and cell compatible 3D hydrogel constructs with remarkable shape fidelity and definition. In general, higher nanocellulose concentrations have been shown to yield better print resolution (Siqueira et al., 2017). Such malleability also permits for the printing of an infinite number of structural configurations which may be customized to meet a range of patient specific requirements. Nanocellulose has thus been exploited in the generation of 3D bioprinted tissue implants for soft and hard tissue replacement (Lin and Dufresne, 2014). Of note, CNF-polyurethane based vascular prostheses were successfully implanted between the brachiocephalic and right common carotid artery in a 26-year old male patient with Multiple Endocrine Neoplasia 2B (Cherian et al., 2011). Similarly, a viable replacement for native human nucleus palposus was also constructed from a carboxymethylated CNF bio-composite hydrogel prepared using UV polymerization of N-vinyl-2-pyrrolidone (Eyholzer et al., 2011). Other novel approaches have included the exploration of a CNC-Polyvinylalcohol composite biomaterial as an external stimuli responsive neural implant (Shanmuganathan et al., 2010) and the generation of 3D bioprinted cartilaginous models for in vivo application (Monllau et al., 2010; Markstedt et al., 2015). The applications of plant derived biomaterials for 3D bioprinting are immense. Enormous appeal lies in their gelation capacity, hydrophilicity, and natural rigidity which appear to emulate the extracellular matrix and render them ideal biological and mechanical candidates for bioprinting tissues, organs, and biomedical adjuncts. Further applications of these natural materials may extend to wound dressings, implantable medical devices and drug delivery systems, potentiated by coupling to bioprinting technologies for truly customizable, and bioactive medical therapies such as wound dressings and drug delivery systems. There is a need to further refine the properties of the bioinks, which appear to be enhanced through combination with other materials to meet the biological and mechanical demands of different tissue types, and a robust investigation into the toxicity of the materials is additionally merited prior to in vivo implementation. Irrespective of the current challenges for translation to clinical practice, this renewable, natural, and abundant set of versatile biological materials hold great promise for revolutionizing the future of bioprinting. TJ and IW conceived the idea for the article, planned the structure, and edited the final manuscript. TJ, GK, and AM each wrote significant proportions of the body of the final manuscript text. TJ would like to thank the support of the Welsh Clinical Academic Training Scheme, the Royal College of Surgeons England Research Fellowship and Microtia UK. The Reconstructive Surgery and Regenerative Medicine Research Group has a joint disclosure agreement for ongoing nanocellulose research with American Process Inc. and a patent pending on nanocellulose bioinks (US Patent Application No. 62/639,38). 1. ^Nanocellulose Market Size—Industry Share Analysis Report 2017-2024. Available online at: https://www.gminsights.com/industry-analysis/nanocellulose-market (accessed December 30, 2018). Chen, Q., Suki, B., and An, K.-N. (2003). Dynamic Mechanical Properties of Agarose Gel by a Fractional Derivative Model. Available online at: https://pdfs.semanticscholar.org/ecfb/27677cc4ba385fa67b547c9c41ae796edd97.pdf (accessed February 26, 2019). Cherian Vengal, J., and Srikumar, M. (2005). Processing and Study of Novel Lignin-Starch and Lignin-Gelatin Biodegradable Polymeric Films. Available online at: http://www.sbaoi.org [accessed December 28, 2018]. Huang, C. Y. (2018). Extrusion-Based 3D Printing and Characterization of Edible Materials. Available online at: https://uwspace.uwaterloo.ca/handle/10012/12899 (accessed March 10, 2019). Sarkar, K., Xue, Y., and Sant, S. (2017). “Host response to synthetic versus natural biomaterials,” in The Immune Response to Implanted Materials and Devices, ed C. Bruna (Cham: Springer International Publishing), 81–105. Wee, S., and Gombotz, W. R. (1998). Protein release from alginate matrices. Adv. Drug Deliv. Rev. 31, 267–285. Copyright © 2019 Jovic, Kungwengwe, Mills and Whitaker. This is an open-access article distributed under the terms of the Creative Commons Attribution License (CC BY). The use, distribution or reproduction in other forums is permitted, provided the original author(s) and the copyright owner(s) are credited and that the original publication in this journal is cited, in accordance with accepted academic practice. No use, distribution or reproduction is permitted which does not comply with these terms.